Following are three new and improved items that I recently tested, all of which will significantly enhance your time on the water. My previous pair of “optic green” prescription shades were far off the mark in terms of color match. The ones I received had some odd blue tint mixed in. I wasn’t pleased. Still, I used them for two seasons and wasn’t too unhappy when they fell into a surging river (tip: never “hold” your glasses using your mouth). Since then, I’ve always been wary of getting prescription shades. You just don’t know what you’ll end up with. I was happy to learn that COSTA offers in-house prescription optics to complement their line of active-wear frames. In-house production is a virtual guarantee for consistent color match and superior lens manufacturing. Why would any company outfit their quality frames with inferior lenses? The Costa Rx line features clean designs, light-weight materials, and the hallmark for any active eye wear: robust lenses. COSTA’s polarized, glare-reducing optics bring things into razor sharp focus, even in less-than-optimal conditions. An extensive range of tints cover a wide range of outdoor activities, including several fishing-specific colors and coatings. I selected the copper tint, which works equally well in diffused or direct light and, quite impressively, rapidly varying light intensities. The collection is available in lightweight titanium, bio-based nylon with trifused colors and handcrafted acetate. All styles offer unique features, such as a 3D topographic “grip zone” patterns in the nose pads and temple tips to reduce slippage. Meticulously refined hypoallergenic surface materials provide comfort and reduce wearer fatigue. Finally, custom-engineered hinges and wire core temples allow adjustability to provide a very comfortable fit. Costa’s new Optical Collection offers a two year manufacturer’s warranty against defects with prices ranging from $150 to $260. Lightweight, sturdy carrying case with microfiber cleaning cloth included. I generally like sling packs but find that for an item that professes to cover all bases (comfort, flexibility, carrying capacity), many are just built too small. 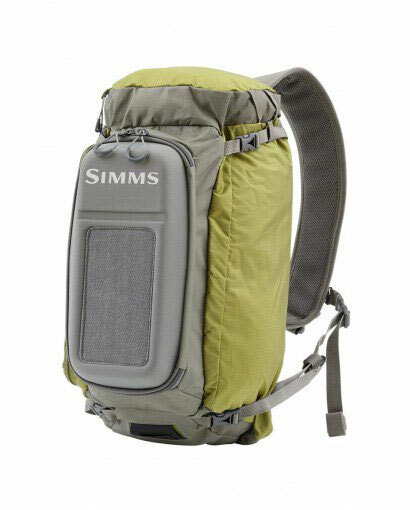 SIMMS has addressed the issue with the large Waypoints sling pack, also available in a micro size for minimalists. The large model boasts 1050 cubic inches (17L) of carrying capacity—about as much as a small/medium sized back pack. It features an intelligently divided interior with different compartments—but not too many—and weighs in at a surprisingly lean 31oz. Designers threw in a sturdy, fold-down work bench, tippet tender, sunglass pocket, and a wide, comfortable carrying strap that aids in weight distribution throughout the shoulder and back. The result is a high-volume fishing sling for conquering gear chaos, pronto. Count on stuffing it with everything you need for a solid day on the water, without requiring a crow bar to extract your stuff. The Eleven.9 hoodie is designed and tested by mountain professionals and outdoor pursuits, it features a tapered fit with easy pull-up sleeves. 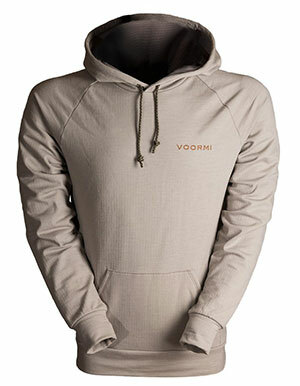 The key building block in the hoodie is a water shedding, surface-hardened thermal wool. Using proprietary construction, VOORMI’s already tough 21.5 micron wool is first treated with a durable water repellent treatment and then reinforced with high performance nylon to ensure long-lasting, weather-shedding performance. DUAL SURFACE™ UL Technology locates a razor-thin layer of moisture wicking polyester next-to-skin while maintaining merino wool dominance throughout the remainder of the fabric. It also delivers a significantly lighter weight merino-based fabric without sacrificing durability or performance (DUAL SURFACE™ UL fabric weighs just under 100g / sq. meter, making it 30-50 grams lighter than the leading ultra-light merino fabrics currently on the market). Other key points: streamlined design, drawstring hood with kangaroo pockets large enough for a couple of medium-sized fly boxes. This is a true three-season, comfortable, versatile, space-saving garment that will allow you to fit additional gear in your duffel bag.